Table Rock Billiard Saloon #1 | Historic Jacksonville, Inc. The Table Rock Billiard Saloon, constructed in 1860, was also Jacksonville’s first museum. Saloonkeeper Herman Von Helms collected fossils and oddities to attract a clientele that then stayed for his lager. 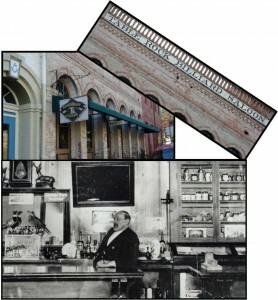 For many years the saloon also functioned as an informal social and political headquarters, home to business deals, court decisions, and even trials. Fire gutted the building in 1960, leaving only the façade. The restored structure now houses the Good Bean Coffee House.